“Euronews got access onto the Russian airbase in Latakia on Syria’s Mediterranean coast. All the Russian military planes in Syria take off from here, making more than 40 sorties each day. The officials claim that in the past six weeks these planes have destroyed more than 2500 objects of what they call terrorist infrastructure on Syrian soil,” he reports. Russian warplanes in Syria act as air support for ground offensives by the Syrian army and foreign Shiite militias. The Russians say they are now also cooperating with elements of the Syrian opposition which provides some intelligence. This, according to Major General Igor Konashenkov, allowed Islamist militants in several key provinces to be pushed back in the last two days, breaking the two-year blockade of the Kweires airbase by ISIS. 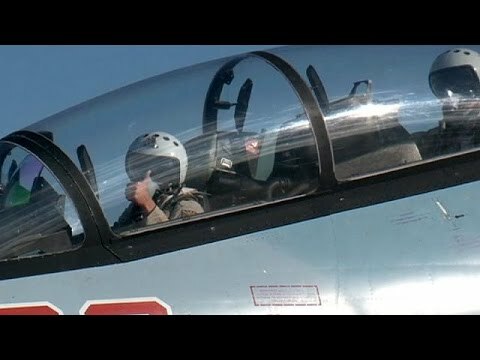 “The Russian aviation hit targets near Aleppo and around the Kweires airbase using the intelligence provided by the Syrian opposition, and confirmed at the Intelligence centre in Baghdad by our partners from Iran, Iraq and Syria,” said Russian Defence Ministry spokesman Igor Konashenkov. The Hmeymim airbase near Latakia has several dozen Russian warplanes, including supersonic bombers and fighters, as well as reconnaissance drones, attack helicopters and anti-aircraft defence. The exact quantities of military equipment and personnel remain top secret. The base receives all its supplies, including food, from Russia. “All our planes based in Hmeymim and taking part in the battles are equipped with the most modern targeting systems. This allows targeting terrorist infrastructure precisely from an altitude of over 5000 metres,” claims Konashenkov. Despite several setbacks in the last few days, Islamist militants retain their grasp over large parts of Syria and occasionally pass onto the offensive, while the forces loyal to president Assad are struggling to defend and expand their zone of control. According to the Russian military, the Islamists are now changing their tactics in reaction to the bombing campaign, better concealing their relocations better and constantly modifying routes for arms and ammunition supply, which may indicate they are weakening. “Russian command says these attack aircraft will keep striking targets as long as necessary – but with no evident change on the ground, the efficacy of Russian involvement in the Syrian conflict remains questionable,” concludes Denis Loctier.